It’s my third week of the In Print ABC Blogging Challenge, http://inprintwriters.com/2013/01/12/the-abc-blog-post-challenge/, but you could begin today! 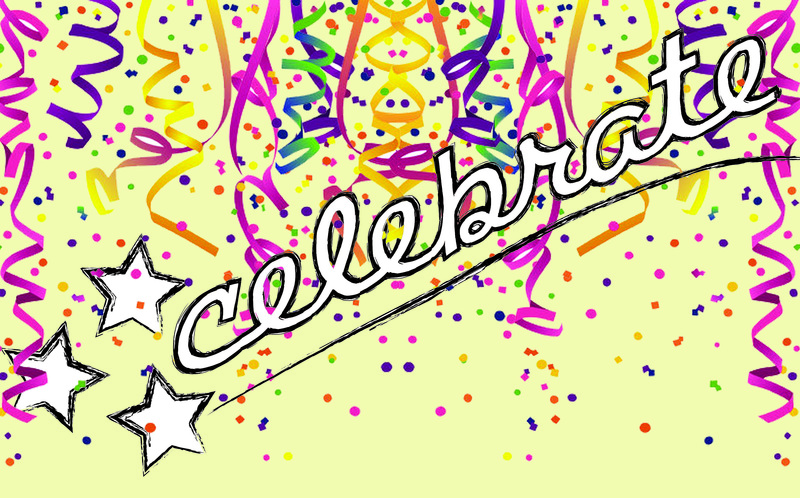 I’m happy to tell you that C is for Celebrate! This blog marks my 52nd, an entire year of weekly blog posts. In that year I have covered a variety of subjects, from me to me. In those blogs I’ve shared things like my post card story, the superlative nature of Wednesdays, plans for my after party, my word nerdery, how I felt about the Batman movie (ugh) and my love of Diet Coke and Doritos. Hey Frito Lay, where’s my sponsorship? I like that I wing it. Usually I wait until Monday morning, after Dave has left and the dogs have been tended, to sit down at the computer and let the thoughts fly. Probably not the most professional of ways to put my writing out there, but I wanted the blogs to be natural, untethered and unedited. I think it’s been good practice for me to write them this way. Yes, there are many that, when I reread them, I cringe, but that’s part of the learning curve. I’m trying to become a better writer through practice and habit. I’m actually kind of proud of myself for making it to week fifty-two. I have a frenetic creative nature; dedication and perseverance are often upstaged by distraction. To quote a common meme, Squirrel! At first I worried that I wouldn’t be able to come up with subject matter week after week, but aha! That’s where the frenetic creative nature comes in handy. As it turns out, coming up with ideas has not been a problem. Of course, I also worried that posting weekly would be a challenge for me. Other than brushing my teeth twice a day and my sacred Wednesdays, I rarely do anything regularly. I have missed a few Monday mornings, but overall, I’d say I could mark a passing grade in the consistency column. Thank you for your eyes and encouragement (two potential E’s!). I could do this without you, but it wouldn’t be nearly as rewarding. I look forward to continuing my MaryFranSays blog, and I hope you will continue to check it out. PS A celebratory shout-out to my C-friend whose birthday I will be acknowledging shortly at brunch over eggs and Grey Goose. Post the damn blog so we can party! This entry was posted in It's all about me and tagged 52 weeks, anniversary, celebrate, diet coke, doritos, frito lay, Mary Lamphere. Bookmark the permalink. Congratulations on your fifty-two weeks–they’ve been terrific! !